Helps you decide between two things. Is there a better alternative to Randomator? Is Randomator really the best app in Gaming Tools and Utilities category? Will Randomator work good on macOS 10.13.4? Randomator... Undecided? Maybe Randomator can help you! This fun app I wrote tries to help you to decide between two sides. 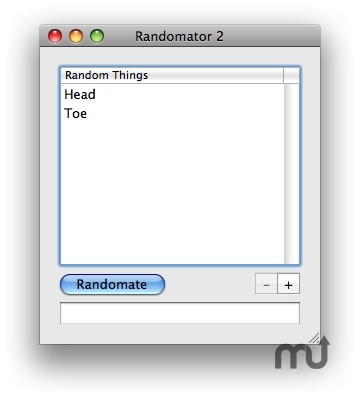 Just enter your things in the two textfields and click "Randomate". PPC binary abandoned! Do not install on a system prior to Leopard or Snow Leopard! Randomator needs a rating. Be the first to rate this app and get the discussion started!